How do good ideas come to life? They simply break free from the digital screen. 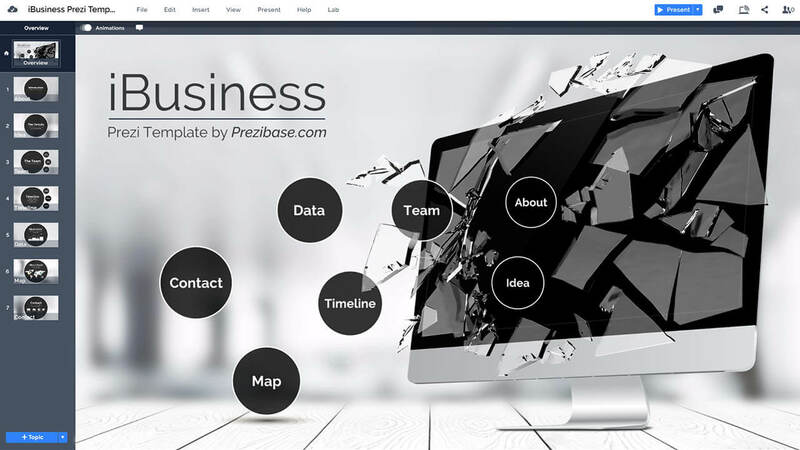 A technology related Prezi Next presentation template for promoting a business idea or website. An iMac computer monitor with broken glass and topic slides flying out of it. 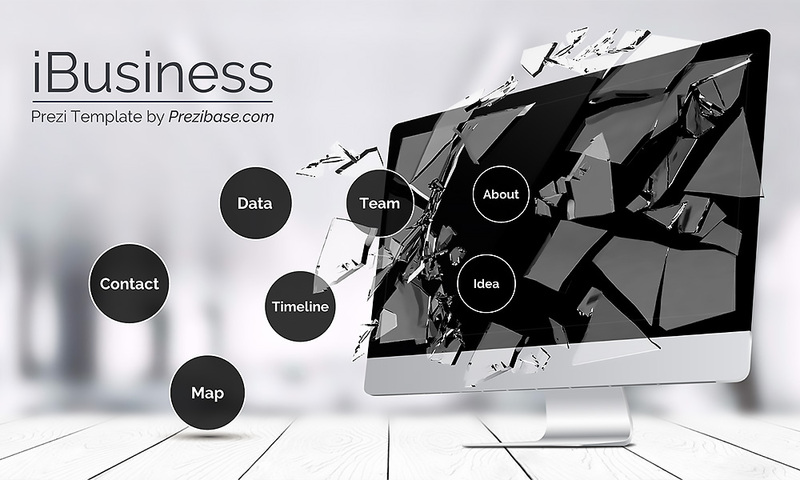 A creative concept for presenting about your technology company or online business idea. Talk about exploding online sales, marketing, hacking, security and economic volatility. Rearrange the elements, customize the colors of the topic circles and easily change the slide layouts. The presentation starts with an overview of a modern looking sleek computer monitor in a bright office desk scene. The “i” in front of business indicates we are dealing with an iMac computer with OS X operating system. The monitor screen is broken with shattered glass flying around and circular topics with text titles are coming out of the screen. The overview slide also includes placeholder for your presentation title and subtitle. The template is most suitable for a business or technology related presentation: introduce a powerful new technology or a promising startup idea. You can also change the background image or replace it with a solid color and edit the colors of the black circles to match your branding style. So go ahead, make an awesome presentation and break the internet… but please fix it later! This entry was posted in Best Prezi presentation templates, Prezi Next Templates and tagged broken glass, business, creative business presentation, creative technology presentation, creative technology prezi next presentation, good business presentation, hacking, ibusiness, imac, it, online business, online marketing, online marketing presentation, online sales, online security, powerful, prezi next template, security template business, SEO, startup, technology, technology 3d prezi presentation, technology presentation, template company promotion, template website promotion, virtual, volatility, voletile business, website promotion presentation.